The average driver pays £90 on unnecessary car repairs because they lack a basic understanding of the MoT, according to new research. 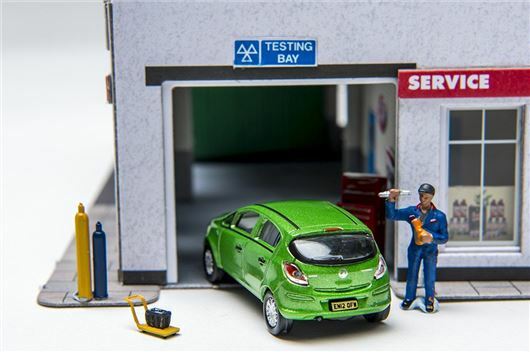 ﻿The annual test was given a complete overhaul in May 2018, with new rules for diesels and tougher guidelines for tailpipe emissions; yet, data from roadside assistance specialist Green Flag suggests that the majority of drivers are lost when it comes to the MoT and getting a good deal on repairs. It's argued that UK drivers collectively overspend by £3.4 billion annually on unnecessary repairs and services when their car goes in for the MoT, with brake fluid changes, anti-freeze refills and fuel cleaners being the most-common up-sells. A lack of understanding of the MoT has been blamed, with roughly half of drivers (52 per cent) saying they had no idea what the annual test involved. "Motorists are becoming less equipped to ensure they’re getting the best deal on repairs"
The research claims that dishonest mechanics are using this knowledge gap to cash in, with a third (31 per cent) of drivers admitting that their lack of understanding hindered their ability to negotiate with garages. Indeed, almost half (40 per cent) of drivers admitted they’d underestimated how much it would cost to repair their car in the past, with inexperienced drivers (aged 17-24) being the hardest hit. Drivers in London, Leeds, Glasgow and Sheffield pay the most on car repairs, with average costs peaking at £508. Nottingham, Plymouth and Brighton came out on top for value, with average spend ranging from £348 - £364. "Motorists are becoming less equipped to ensure they’re getting the best deal on repairs...this is particularly evident by our findings that 61 per cent aren’t sure what MoT stands for, and the fact that 39 per cent don’t understand what is being checked during a test," said Nick Reid, head of automotive technology at Green Flag. And who is this guy that comes with the conclusion of the £90. Don't tard all motor mechanics thank you very much!!!! Take your vehicle to a Local Authority depot. Many have them they do MOTs and they do not sell add-ons. The Audi dealer I bought my car from later pestered me to buy new tyres at MOT 'luckily we have them in stock' when they were down to 4mm. I had several phone calls later to see if I'd replaced the tyres. They lost a customer permanently. I replaced them 12 months later. The Audi dealer I bought my car from, at MOT later, pestered me to to buy 2 new tyres as the tread was down to 4mm 'luckily we have them in stock'! Later, having declined their kind offer, I had phone calls aggressively asking me if I had changed my tyres and saying that I nust! I did, twelve months later. The Principal was informed of my displeasure at being pestered, and they have lost a customer. It's not as bad as it was in the 80's, been tightened up a bit, but still needs better controls to protect the motorist. I had a Focus bought new, at 3 years old & 24k miles, National tyre man said I needed new front discs. I had only gone for front tyres not mot. I took the car to a local independent for mot tests, never failed, not even an advisory until 10 years old then it got an advisory on rear discs. The following year, the discs were ok? Got an advisory on 2 suspension rubbers. Problem with the discs was down to lack of use, bit of rust through not being used for a couple of weeks. Should be obvious to any skilled mechanic. Always take it for a good run before mot test. Spot on dafman. One local mot man lost his licence for bodging up an insurance write off, the buyer reported him. This was at least 15 years ago, he's not got it back. Is it not about time that MOTs were carried out at government run centres, as in the US, where there is no money to gain by failing vehicles. Totally agree, all ITV, (Spanish MOT) stations are government run franchises. The staff are strictly examined on their abilility and knowledge. I think the stations are better equiped with the latest technology especially for the checking of all the underpinnings. They do not provide"after sales services". A sticker is placed on the inside of the screen in the top corner of the passenger side showing the year and month for the next test. Easily observable by those who need to know. Indeed, was just going to say that about the system in Spain. I worked for the ITV company in Andalucia and actually took my 2005 Polo for its annual test here just last week. They either pass it or fail it. No money to be made at all so they have no motivation to be anything but totally honest. Ot is a very thorough test and only costs slightly over €30. It works and the UK should definitely adopt that system. If you go to any garage that does repairs and MOT's, you can bet your life they are going to find something to add to your bill. Even when there is nothing wrong with your car, they will damage something or not, some of them can't even be bothered to damage the parts that they say need replacing, they will tell you such and such needs doing, and you have to pay because you need the MOT cert by law. Of course I know all this because I have been doing my own repairs for the last 40 years, and when some clown tells me something needs fixing, I know for a fact he is lying. Garages that repair vehicles should not be allowed to do MOT's, that is like asking a fox to guard a hen house. Last time- I said MOT and service, he said I will do the MOT and with your mileage you do not need another service, but I will check all oil levels and condition. I only do1500 miles a year and a proportion on fast dual carriageways. My garage,one of the ones in your list - T&H Motors in L/Spa is excellent on MOTs' etc Last time- I said MOT and service, he said I will do the MOT and with your mileage you do not need another service, but I will check all oil levels and condition. When I collected it he said oil 'clean enough to fry chips in !!!' I only do1500 miles a year and a proportion on fast dual carriageways. ETC ETC !! If oil is clean, it often means that it is rubbish at cleaning the inside of the engine. The dirt is best in the oil and not clagging up the oil pathways. I have just traded in an 11 year old Ford Focus diesel with 190000 on the clock. serviced and MOT'd every year by my local garage. Only failed once for a broken spring which I knew about. There are some damned good local garages out there. Find a good one and stick with them. I wouldn't trust main dealers and far as I could throw them, once the car comes out of warranty, and as for the national tyre and mot centres, the less said the better. Here in France it's the same as the USA and Spain. CT (Controle Technique) centres are appointed by the government and don't carry out repairs. 2 weeks for Serious repairs, 2 months for necessary repairs and re-test and non compulsory advisory repairs. Tyre repairs/replacements are a related topic; companies such as NorAuto and FeuVert when replacing an irrepairable damaged tyre always try and insist on replacing both tyres on the same axle even if the difference in tread depth is less than 3mm, I always refuse which they grudgingly accept. They always say they've tested and need to replenish the brake fluid, and need to have the toe-in (geometry) checked even though I know the car was serviced a few weeks before! On a cheap oil change by a large franchise dealer quite a few years ago with my father -in- laws MK2 fiesta. I was asked if I wanted a safety check, of course thank you. Later he came back with the report and asked if I wanted to see the car as it was up on the ramp. He pointed out it needed 2 new front tyres which changed to one needing replacing in a few months as we walked to the car. When underneath it was pointed out to me the exhaust was rusty, it lasted another 4 years, also the brakes needed replacing as they were half worn ??? Walking back to the waiting room he apologised and said the manager had told him to find faults with cars. I said goodbye and paid £8.99 for the oil change and new filter. Bargain, I knew what these garages were up too. As an MOT tester and independent garage owner I can tell you the one, single most important thing to consider when booking a test is the price. And maybe not in the way you're expecting! The DVSA set the maximum price of a class 4 test (ordinary car if you like) at £54.85 and yet you see places offering tests at £25 or less. Now given that a proper test takes between 3/4 of an hour to an hour and most places these days have to charge around £50 an hour labour what does that tell you? Then think that unless you've paid out more for a "one man testing" set up most of test needs two people. I charge full price, £54.85. But before you say I'm overcharging consider that I don't care if you're car passes or fails, or not on financial grounds anyway. I've earned my money by doing the test, I have no need to find anything wrong to make a living. If I DO find anything wrong of course I'll fail it but that is to keep you and every other road user safe. NOT to make money.